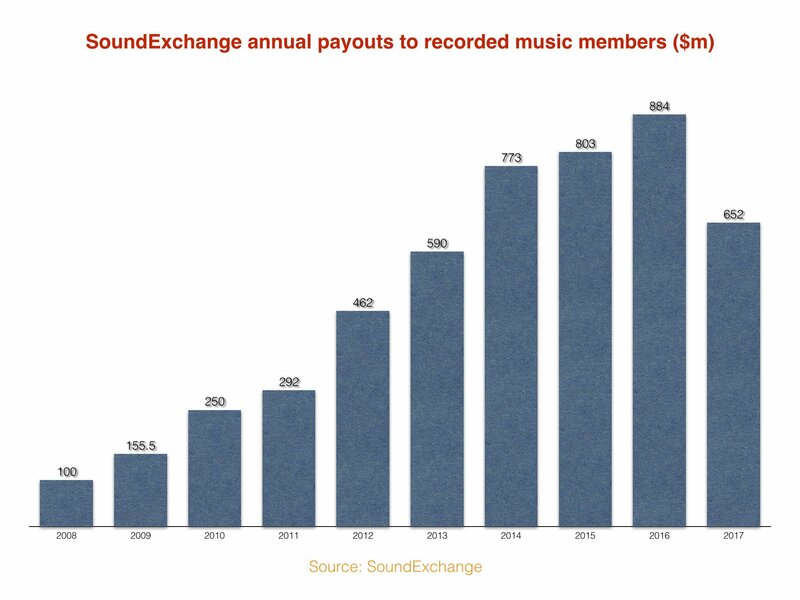 SoundExchange has now exceeded $5bn in lifetime royalty distributions to its members since being founded in 2003. The US organization, which collects performance royalties from online radio platforms, paid out a total of $652m to recorded music rights-holders in 2017 to surpass the milestone. That figure represented a significant (-26%) drop on the $884m paid out in the prior year, but this wasn’t unexpected – thanks to the slowdown in digital radio’s growth, coupled with the fact that leading rightsholders (including the major labels) have now established direct agreements with Pandora. In 2017 SoundExchange diversified its offerings to add services for the music publishing community in addition to its core business managing digital sound recording performance royalties. SoundExchange President and Chief Executive Officer Michael Huppe (pictured) said: “Surpassing $5 billion in digital radio distributions marks an important moment for the new music economy. It’s a milestone for the digital music services and, of course, for the artists and rights owners who create the music that makes those services possible. SoundExchange has recently extended its duties with the formation of SXWorks, a wholly-owned subsidiary that provides global administration capabilities to publishers. With the acquisition of the Canadian Musical Reproduction Rights Agency Ltd. (CMRRA) in May, the SoundExchange companies expanded the scope of rights represented to include the mechanical rights of music publishers in Canada, in addition to the sound recording rights the company administers in the United States on behalf of all artists and rights owners. Moves such as this saw gross distributions to members from all of SoundExchange’s divisions hit $683.1 million in 2017 – meaning that over $30m was paid out to publisher members. SoundExchange continues to manage artists distributions of Pandora royalties on behalf of rights owners for the ad-supported tier of the Pandora service. SoundExchange was selected to administer these artist royalties by more than 50 major and independent labels.